St. Angela (1470-1540) was born in northern Italy. In 1535, she founded the Order of Ursulines, the first women's teaching order approved by the Church. Italy then was rife with violence and immorality. 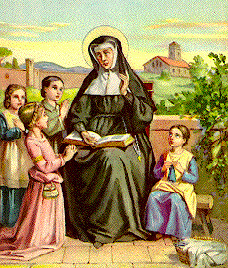 St. Angela believed that the formation of Christian women in society's greatest need. Keep sane and sober for your prayers. Above all hold unfailing your love for one another, since love covers a multitude of sins. Practice hospitality ungrudgingly to one another. As each has received a gift, employ it for one another, as good stewards of God's varied grace: whoever speaks, as one who utters oracles of God; whoever renders service, as one who renders it by the strength which God supplies; in order that in everything God may be glorified through Jesus Christ. To him belong glory and dominion for ever and ever. Amen. On the way [to Capernaum] they [the disciples] had discussed with one another who was the greatest. And He [Jesus] sat down and called the twelve; and He said to them, "If any one would be first, he must be last of all and servant of all." And He took a child, and put him in the midst of them; and taking him in His arms, He said to them, "Whoever receives one such child in My name receives Me; and whoever receives Me, receives not Me but Him who sent Me."